Name: Coldthrone(nicknamed Skull ripper). Height: 8' 1". Weight: 467 Lbs. Physical description: He is what most view as a "Classic" Yautja. His skin is greenish gold with brown speckling on his head, limbs and torso. He lacks the quills of older Yautja and is considered a Young blood by his clan. His most unusual feature(other than his larger than average size) are his violet colored eyes, far from the usual yellow. 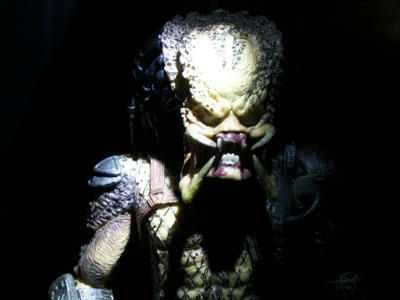 He has slightly longer the average mandibles due to his mother being a quarter "Super Predator". Bio Mask and Armor description: Navy blue bio mask with four overlapping rectangles up the middle of the forehead with a upward pointing rectangle with a slight inward curve that is placed in between the eyes of the helm. Gold trims the top edge of each overlapped rectangle. The erect bar between the eyes, is also trimmed with gold, but on the sides as well. There are two vertical golden lines on each eyebrow of the mask. 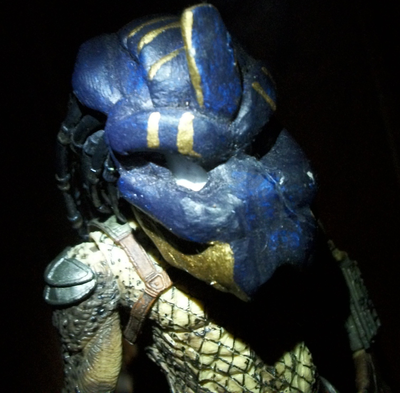 Underneath the pronounced cheek bones of the helm, from the back of the jaw too nearly the muzzle, is gold. The eyes of the bio mask are solid white. Its design is Egyptian and is a sacred family heirloom passed down through the generations of his family who had a major influence on Egyptian culture. He wears a long tan fur cloak, but never with his Egyptian bio mask. He wields a massive two handed battle axe that was his fathers. His wrist blades are as follows, two normal sized blades with a much longer one in between them. He is a whimsical Yautja. Life history: He was born to the Clan "The Hunters Moon" to an esteemed family who's interaction with Humanity dates back to ancient Egypt whom they greatly influenced. He is the eldest son of the purest line of his family and after his own fathers death he received his fathers Battle axe and the sacred Bio Mask passed down through the generations. He is somewhat broken inside, he felt no love for his father and his mother was dragged out of their home at night and killed for being a quarter "Super Predator" by fanatics who's skulls now sit upon spikes on the throne of the homestead for their unjust crime. He has many younger siblings who are his wards(save his younger sister and two brothers(who are twins) who are only slightly younger and are adults in Yautja society).